While doing research, I discovered there are all types and sizes of sanders and sand paper! Fine, coarse, super grit, wet, dry, large, small…YOWZA! Who knew?!? As you can probably tell, I’m not a real “do-it-yourselfer”. I figure there’s a whole industry built around the handy-man concept and that’s what they’re there for. Use them. Besides, I’d break a nail. On the other hand, if it can be fixed, built, remodeled, adjusted, whatever, Mr. Gypsy knows how. I am always amazed (closer to awe) at how he manages to get it done. 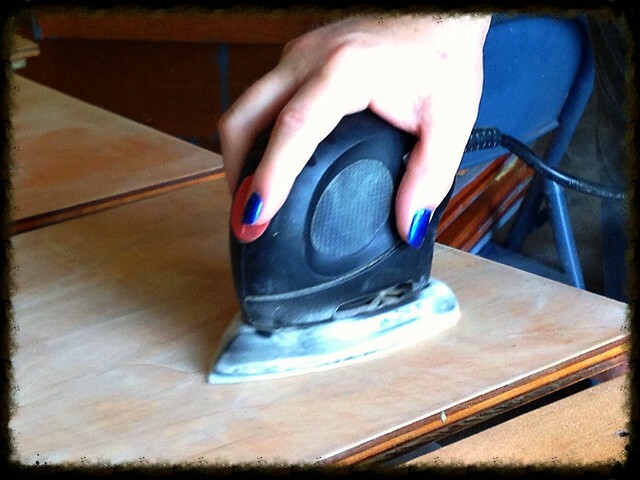 She decided to sand the cabinets down to their natural wood and it was beautiful! As Believers, there are times we find ourselves lying on the table (or prostrate on the floor), in Gods workshop, undergoing a “spiritual sanding”. Sometimes it’s a gentle sanding with an emery cloth, just to smooth the edges. Other times it requires a very rough grit paper, attached to a Holy Power Sander, to get to those deeply ingrained imperfections. He gently rounds out the corners of our hardness or rolls up His sleeves to tackle the more deeply imbedded imperfections which mar our Godly beauty. I imagine He’s gone through a truck load of various grains of sand paper on my life alone! In my ponderings, I picture Heaven being furnished with that really cool “distressed” furniture. It gives God’s glory all kinds of cracks, crevices and holes to shine through. After all…He certainly has a lot of “distressed” kids! 1 Corinthians 1:27(AMP) [No] for God selected (deliberately chose) what in the world is foolish to put the wise to shame, and what the world calls weak to put the strong to shame. Kinda makes a person grateful for all those imperfections. I don’t see God sanding down all our imperfections. Paul lived his life with a “thorn”. As with the furniture, it allows God’s Glory to radiate out through the cracks into a broken world. Remember…Do not lose courage in considering your own imperfections. ~ Saint Francis de Sales Just be willing to undergo the Divine Sander. He’s definitely rolled back his sleeves and used the rough grit paper with the Holy Power Sander on me!!! Great Read, Auntie Deb!